By Car (from Palma de Mallorca?s Son Sant Joan Airport): - Leave the airport, heading towards Palma. - Continue on this road and leave at the next exit for Via Cintura/ Andratx - Continue until you see a sign on the right-hand side for Inca/Port d'Alcudia. - Take this exit. - Continue on this road for about 40 km, until you arrive at the roundabout. - The exit for Pollença is off to the left and is signposted at the roundabout. Situated only a few steps from Pollença town square, the hotel provides guests with a welcoming and informal atmosphere. There are six comfortable guest rooms, equally stylish, whilst having their own individual character. It is a truly excellent choice for those who are looking for comfortable accommodation in an interesting and historic location. The province of Pollença is one of the most beautiful areas on the island of Mallorca. As well as many areas of natural beauty and wonderful sea and mountain landscapes, the region also has many cultural attractions. The beautiful sights of Calvario and the Pont Roma are well worth a visit, as is the fascinating city hall museum. Pollença also plays host to a music festival and there are regular art exhibitions. Book L'Hostal - Hotel d'Interior at the best price. 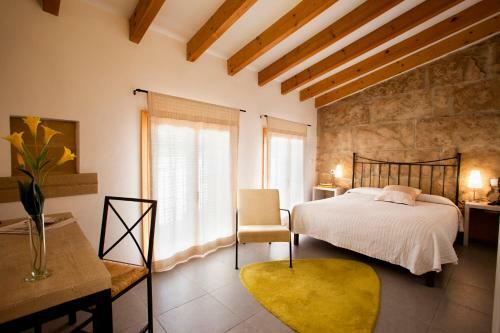 Detailed description, pictures, trusted reviews and offers for handpicked hotels in Pollenca.